Dr. William P. (Pete) Leaness grew up in West Philadelphia and is regarded as the Dean of American Collegiate Soccer Coaches. He compiled a record of 245 victories, 97 losses and 36 ties during his 41 year tenure as Temple University’s head soccer coach, which began in 1930 following his graduation from the Temple School of Chiropody. He developed 36 All-Americans during his coaching career, won NCAA national championships in 1951 and 1953 and earned three other NCAA post season payoff bids. As an undergraduate at Temple he was a star in both baseball and soccer, earning All-American honors in both sports. 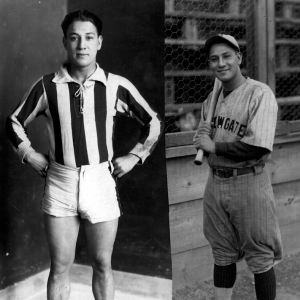 In 1929 he was named Temple University’s first soccer All-American. As a third baseman for Temple he batted over .500 and was a member of the first all-star college baseball team ever assembled. As a member of that team, he traveled to Cuba where his home run led the Americans to a 3-2 victory over the Cuban Telephones. He turned down an opportunity to play professional baseball to devote all of his time to the practice of chiropody and soccer. Leaness passed away in 1972.